Subject: UN IMF PART PAYMENT NOTIFICATION OF YOUR LONG OVERDUE PAYMENT RELEASE PLEASE KINDLY RECONFIRM YOUR CONTACT ADDRESS, PHONE NUMBER AND PERSONAL ID FOR YOUR PAYMENT AUTHENTICATION AND RELEASE OF YOUR FUNDS PLEASE DO NOT BORDER TO REPLY IF YOUR PAYMENT IS ALREADY RECEIVING ATTENTION BY THIS OFFICE. Re: US$2,750,000,00. (Two Million Seven Hundred And Fifty Thousand United States Dollars Only) Part Payment of Your Over Due Outstanding Debt. Be informed that the United Nations, World Bank and International Monetary Fund (IMF) have in view of the global economic reality reached a consensus with the Nigeria Government under the leadership of President Mohamadu Buhari that every legitimate beneficiary's payment found satisfactory after due payment verification should be released without any charges except for the procurement of the (BPPF) AO1H which is for the processing of the beneficiary' s payment which value of the form should not exceed the global standard cost of US$295 (Two Hundred & Ninety Five United States Dollars Only) as approved by the World Bank & IMF which is in strong compliance of Beneficiary Statutory Payment Act of 2002 and as amended in 2007. It was therefore agreed that any other statutory cost ' ' excluding the Beneficiary's Payment Processing Form (BPPF) Form (AO1H) of (US$295 only) for the processing and release of your fund' ' and every other charges or fees delaying the release of any beneficiary' s fund should be deducted from the principle amount. In strict compliance to this payment resolution, you are advised to reconfirm your details which should include your direct contact telephone and scanned copy of your international passport or drivers license to enable us send you the (BPPF) Form (AO1H) for payment re-validation, processing and release of your prolonged payment which has been delayed for so long without any positive result after all the funds you might have possibly spent in your pursuit of this fund without any additional cost and should you have any questions do not hesitate to do so. Thanks as we look forward to your timely response and to process your payment please kindly get in touch with this office and pick up your payment processing form and thanks for your anticipated cooperation. 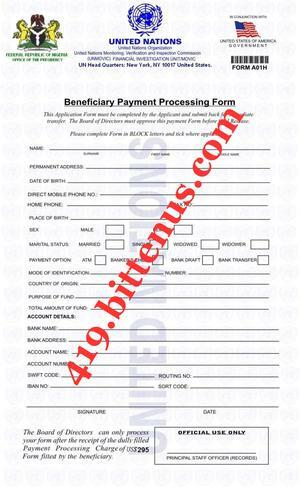 Subject: Dear , ATTACHED IS YOUR PAYMENT PROCESSING FORM AO1H FOR YOUR PROPER FILLING. Re: Re-validation of US$2,750,000,00 (Two Million Seven Hundred Fifty Thousand United States Dollars only) Part Payment of Your Long Overdue Payment. We hereby acknowledge the receipt of your email with your attached id and contact address as requested for the authentication and release of your fund and in response to our payment notification. Be that as it may it's my profound gratitude and that of the entire committee to inform you that it would be our honor to work with you in order to successfully actualize the genuine release of your payment as we are here in this country from the United States to put things right and I am glad to inform you that we working untiringly even working extra ordinary hours in consideration of different country time zone and days in other to meet up our payment schedule as we speedily approach the end of the year and I also wish to use this ample opportunity to assure you that with your cooperation we would successful accomplish the release of your fund under our authority and strict supervision and be informed that the $295 is not a fee but the cost to obtain the payment processing form and also for the processing of the fund and procurement of some legal documents backing the legality and legitimacy of this payment in your name and favor. In this regard your payment would be released after payment processing without any additional cost or taxes. Be that as it may and in order to effectively proceed with the processing and release of your funds in consideration of the limited time frame we have to accomplish our payment list we hereby attach your payment processing form for your proper filling and endorsement. You are therefore advised to fill the form properly without alterations and chose your preferred payment option among the listed options to receive your funds and send back the filled form for your payment authentication, processing and release of your fund. Be that as it may we have also enclosed the information to receive the payment processing levy which is required for the processing and release of your fund and the $295 can be sent by Western Union or Money Gram in the below name and address and the MTCN or Money Gram Reference Number should be sent strictly by text to my direct phone number +2348095534496 for the safety of money sent. In the light of the above and in consideration of the limited time frame we have to accomplish our payment schedule as we are speedily approaching the end of the year, we would appreciate you maximum cooperation to enable us accomplish the release of your fund without bureaucracy. Furthermore be informed that the Federal Government of Nigeria in conjunction with the IMF United States Government and the United Nations respectively granted this partial waiver conses-ion of all fees or charges delaying the delay of your fund and all you need to pay is the little cost to obtain and process your fund which is the only cost you have to incur to accomplish the final release of your fund, In this regard as soon as we received your payment processing form properly filled we shall advice you on the release of your fund and please be informed that this $295 is also for the procurement of some legal documents backing this payment and the release of the fund in your name and favor for the free movement of your payment and funds to you without any problem. Consequently be informed that in thoughtfulness of a possible ugly experience you might have had in the pursuit of your payment considering some points you made in your email or putting into caution on whomever that might have succeeded in scamming you or attempt to scam you in the course of pursuing your payment, we would honestly appreciate you henceforth desist from further communication with such person or group of persons and adhere strictly to our payment release procedure hence we would appreciate you follow specific instruction from this office so that we can work assiduously and collectively with you to enable you receive your funds genuinely and irreversibly and be rest assured that with the strict monitoring of this office, your payment would be finally released without prejudice in order to bring your long protracted payment to fruition for your financial and socioeconomic well-being. Finally please note that this payment processing exercise is expected to be completed within (3) working days with your cooperation and your funds would be released via any of the preferred payment option you would chose. Thanks as we look forward to your urgent and timely response to enable us process and release your payment accordingly without any additional cost while thanking you for your cooperation and should you have any need for further clarification please do not hesitate to contact Dr. Jefferson Makati directly on +2348095534496. Subject: Dear , REMINDER, ATTACHED IS YOUR PAYMENT PROCESSING FORM AO1H FOR YOUR PROPER FILLING.